Finding activities to keep the kids busy over the holidays can be hard. You can feel a little bit overwhelmed and not sure where to start looking for ideas. 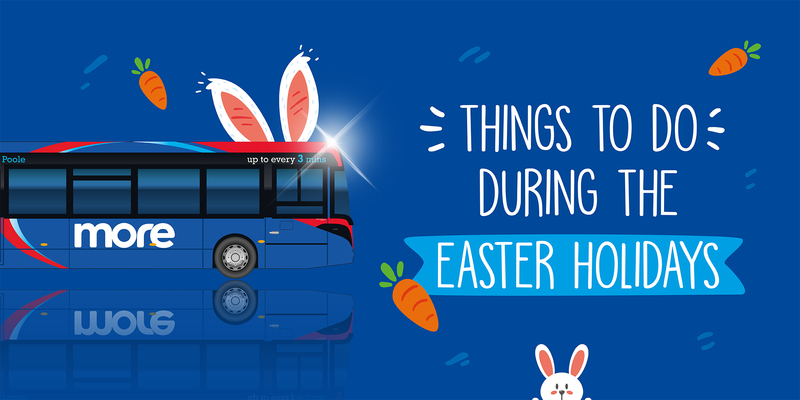 With this in mind, we have rounded up a list of things to do during the Easter weekend that the kids (both big and little) will love. Hop along to Poole Museum until the 22nd April to find the hidden bunnies in the cases. Complete the trail to collect your chocolate prize. This is free to take part in and available during museum opening hours. (10am-4pm). Explore the hidden places of the medieval ruins to complete the activities and claim your chocolatey treat. You will need to use all of your senses to complete your egg hunt and discover the fun facts about the bats who call the castle and wider Purbeck their home. Create your own Purbeck bat in the craft tent and hang it in the castle's secret bat cave. From 30 March, Wimborne Model Town will be delighting local families with its vintage fun. There will be an egg-citing Easter Egg Hunt Quiz to complete from 6th to 22nd April where children can search for the clues hidden in the shops and buildings, that make up the miniature 1/10th scale world of Wimborne in the 1950s. The Easter fun doesn’t stop there as there will be entertaining family fun shows with magic and jokes, for no extra charge, on 9th, 11th, 16th and 18th April, at 12 noon and 2pm. Another seasonal activity is an Easter Crafts session on Wednesday 17th April. Enjoy the Easter Holidays down on the farm! A full day out every day PLUS Daily Egg Hunts from Good Fri 19th to Easter Mon 22nd April. Spring into Easter with Farmer Palmer's, because they know family fun! The Park will be brimming with baby animals such as Pygmy Goat kids, lambs and chicks, during the Easter holiday. Plus, there’s acres of adventure to explore and a daily timetable of hands-on animal events. Make the most of Poole's stunning miles of coastline and feel the breeze out on the shimmering water, sit back or hit the waves and feel energised. Spring into action and test your skills at watersports. Experience the thrill of the water and try something new - Poole offers every watersport imaginable. Reach new heights this Easter with a RockReef adventure on Bournemouth Pier. Take on the 28 climbing challenges, Pier Cave, HighLine obstacle course or the adrenaline-pumping Vertical Slide or Leap of Faith. If you’re feeling brave enough, try the PierZip, the world’s first pier to shore zip wire experience. Activities are suitable for youngsters aged 4 and up, and some height and weight safety restrictions apply. You may wish to try all the indoor activities with the brand new Ultimate Ticket for only £29 each. Spring flowers really do brighten up the landscape and can be spotted on many trails and walks throughout the county. Children are able to learn about how the appearance of certain flowers signify the changing of a season. Snowdrops, crocuses, daffodils and bluebells flourish within a short space of each other but their appearance always follows the same sequence. There are beautiful bluebell walks in Kingston Lacy in Wimborne Minster; and Pamphill Bluebell Woods near Wimborne – where often the aroma is equally as pleasing as the sight of the flowers. Warmer weather and lighter evenings make spring the perfect time to enjoy a coastal walk. Bournemouth is surrounded by amazing countryside so it’s the perfect place to head if you want to get some fresh sea air and feel the sun on your face. Take a leisurely stroll from Bournemouth Pier to Sandbanks beach and enjoy beautiful seaside views along the way. There are no hills to tackle on this walk and plenty of cafés and restaurants along the way. If you’re a regular hiker, you will appreciate the walk from Bournemouth Pier to Swanage, which takes in stunning views of Old Harry Rocks, and The Pinnacles, Studland and Bournemouth beaches. Join in this Easter at Studland with the Easter Egg Hunt to help Bunny find his hidden eggs. The hunt will take you along the beach and through the nature reserve and if you find Bunny's eggs you can collect a chocolate prize at the end. £2.50 per trail, subject to egg availability.